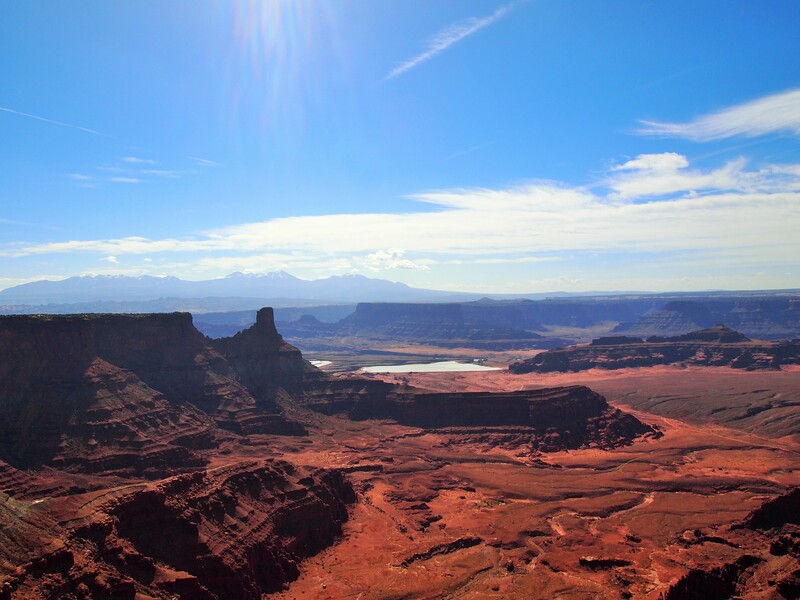 For our final day in Moab, I had my sights set on Dead Horse Point State Park. Zach had arranged to teach a brass master class at the local high school in the morning, so I dropped him off and went back to pack up our room with Pam. 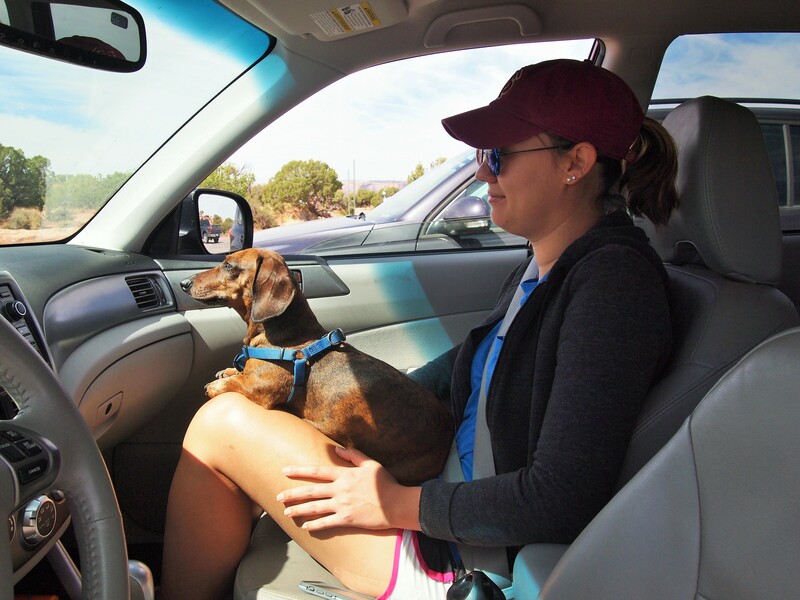 We loaded up the Subaru and set off with Truman toward the park. 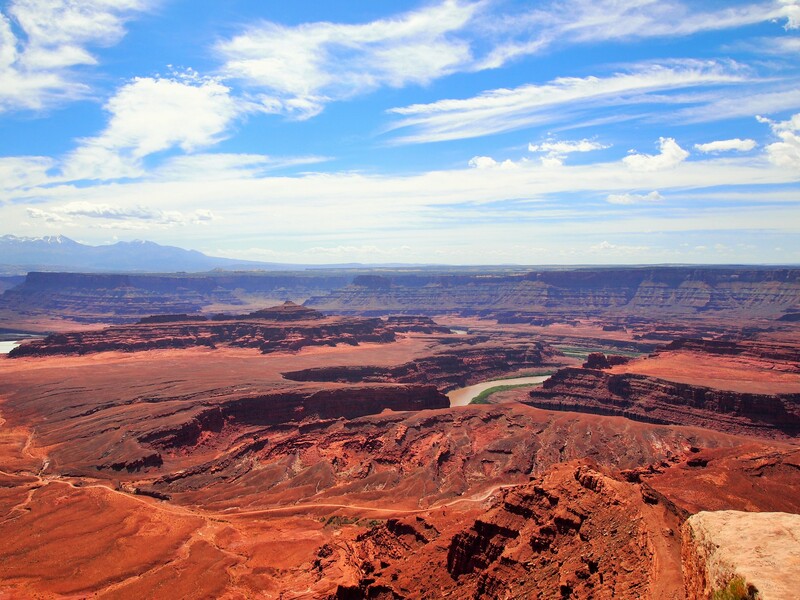 Dead Horse Point SP is located on the same mesa as Island in the Sky. 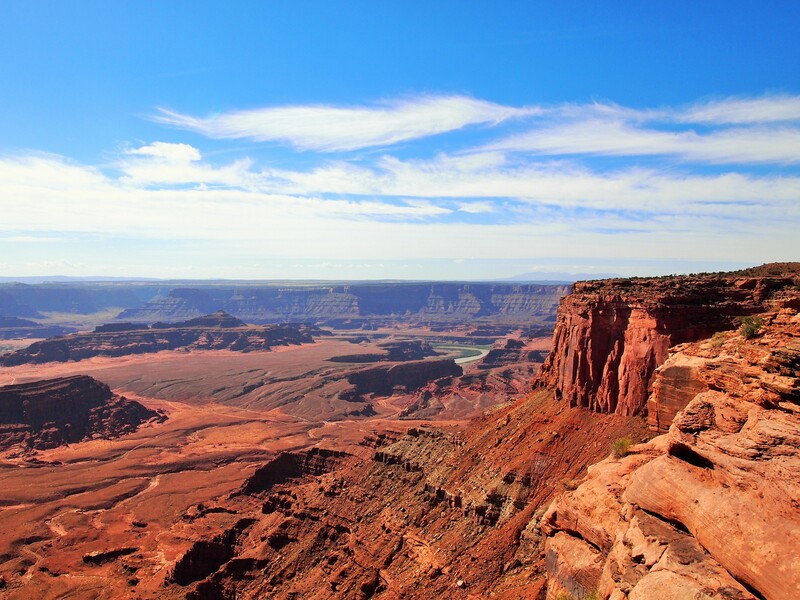 It’s on the east side of the park with perfect views of the Colorado River as it winds through the canyons below. 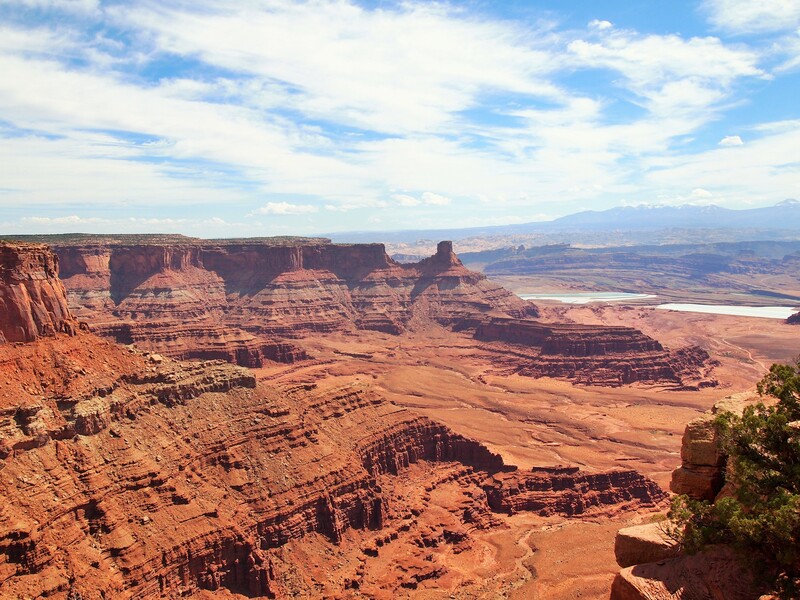 Though the park has 16 miles of mountain biking trails and 7 miles of hiking trails, the main attraction is Dead Horse Point, a small rock peninsula connected to the mesa by a thin strip of land called the neck. According to local lore, cowboys around the turn-of-the-century used the peninsula as a corral for the wild mustangs which roamed the mesa. They would herd the mustangs onto the point and block the neck, only 30 yards wide, with brush or branches. Then they could pick the horses they wanted to keep before allowing the rest to continue roaming the mesa. Legend has it that one time the corralled horses were left on the point and died of thirst within sight of the Colorado River 2,000 feet below. 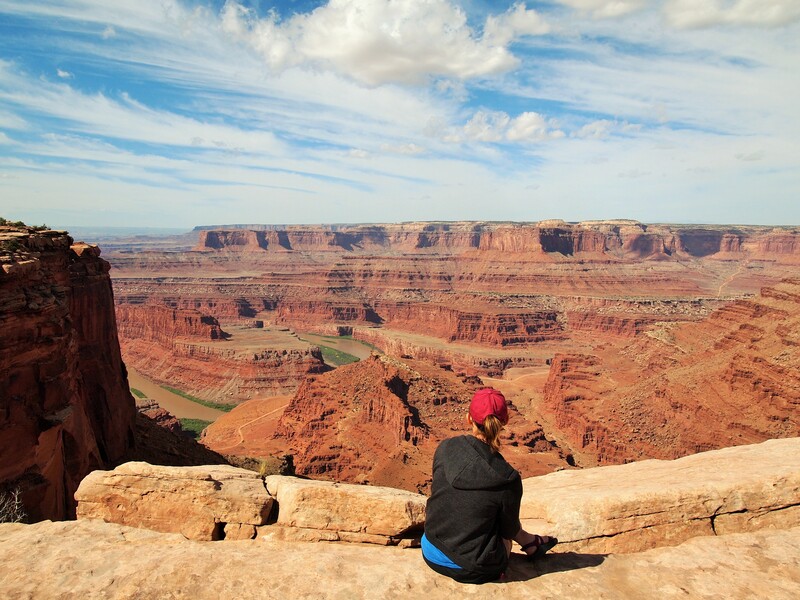 Hence the name, Dead Horse Point. 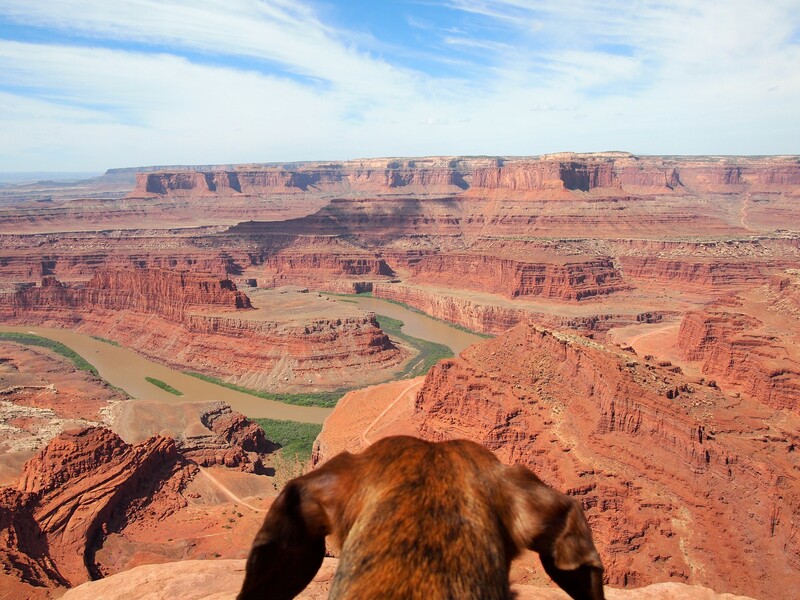 Since Dead Horse Point is a state park, dogs are allowed – leashed – on the hiking trails and at the viewpoints. Truman really loved being out with us and was on high alert for lizard sightings. 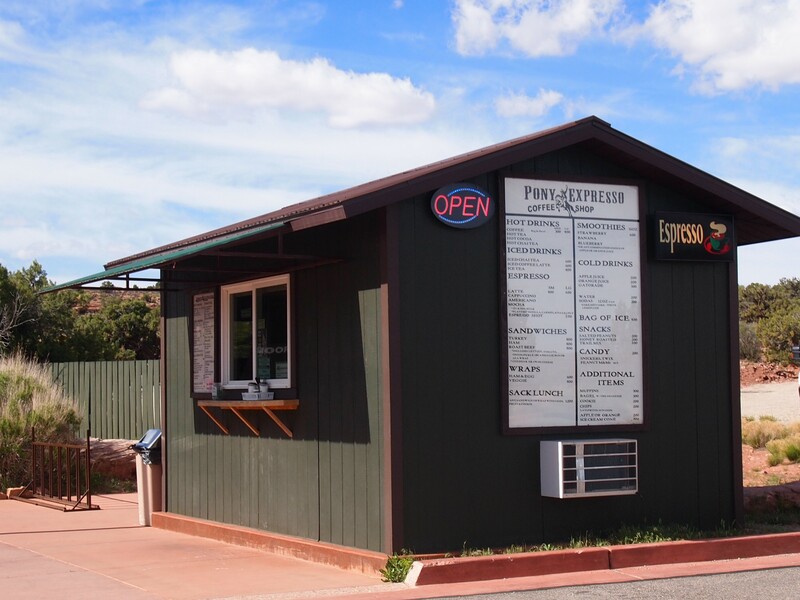 We stopped first at the visitor’s center for some coffee and muffins at Pony Expresso, a small coffee stand out front, and walked along the paved nature trail with Tru. He was very eager. 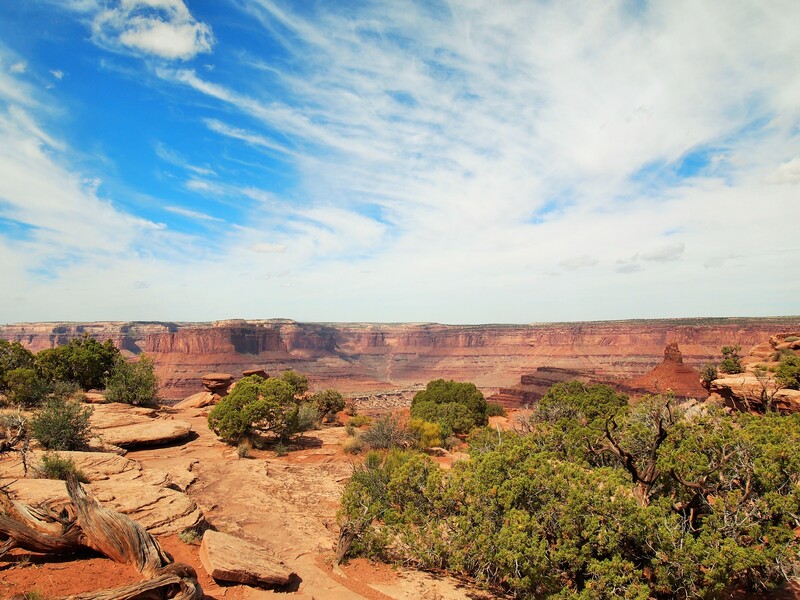 The nature trail followed the rim of the mesa and eventually split off to become the East Rim Trail which ends up at Dead Horse Point. 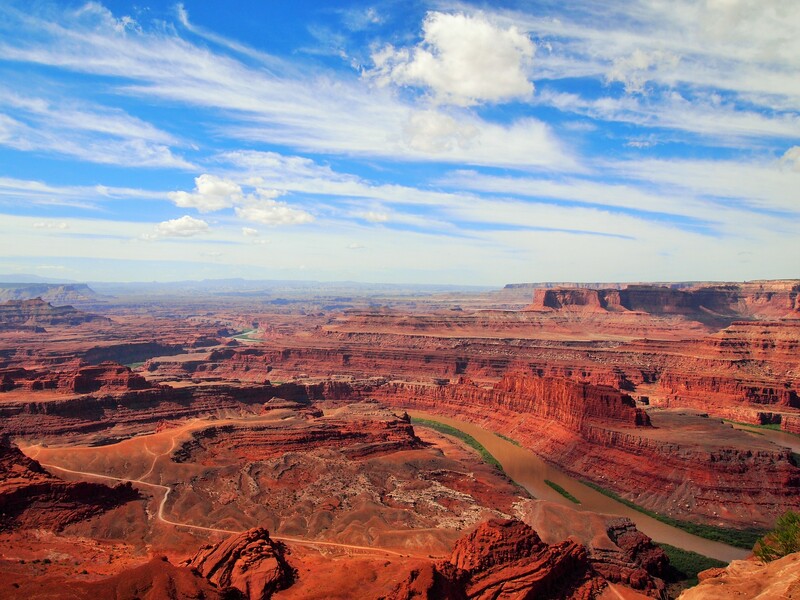 From a couple overlook spots we could catch a glimpse of the Colorado River, the stunning red landscape below, and some bright blue pools of water. The pools are solar evaporation ponds for a potash (potassium chloride) mine. The mining company uses the pools, dyed blue to speed up evaporation, to harvest salt which eventually becomes plant fertilizer. We hopped back in the car and drove toward the point, stopping briefly at Meander Overlook which gives you a little taste of what to expect from the Point. The views from the Point are simply incredible. I was in awe; you feel pretty insignificant standing before such a vast expanse. We spotted a couple of boats out on the Colorado and they looked like tiny toys. Even though the wind was gusty, the view was still fairly clear. We could see for miles. The East and West Rim Trails meet up at the point, so once you walk to the main overlook you can follow those around on either side. 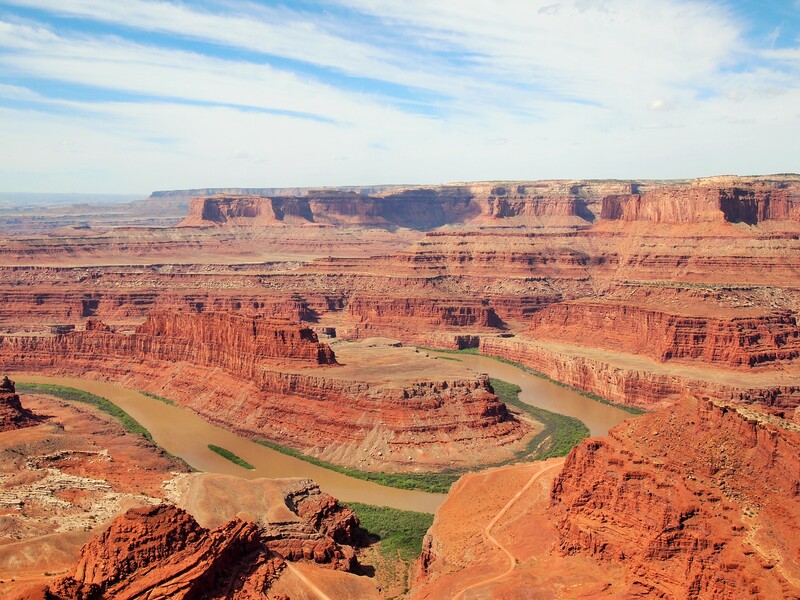 There were a couple great spots along the path, but the main overlook provides a fantastic view of the gooseneck of the Colorado River 2,000 feet below. 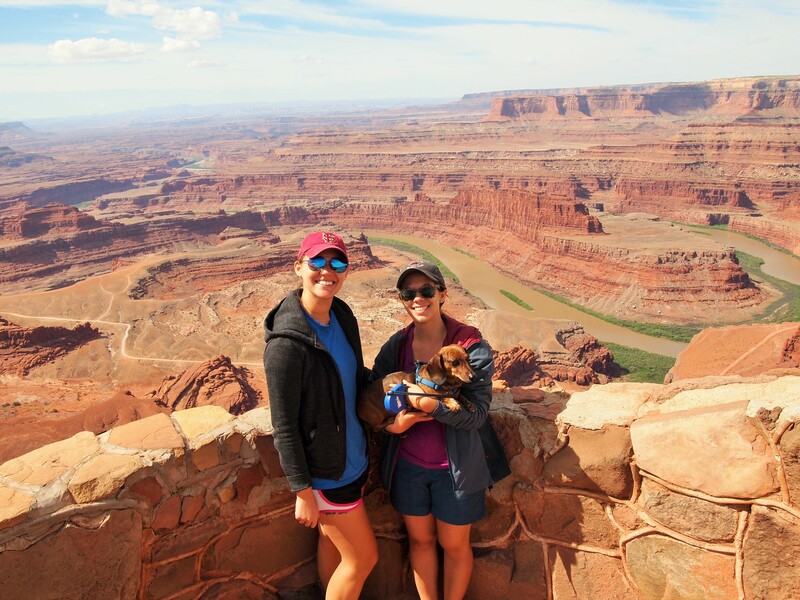 As we walked up to the overlook, we spotted a giant speckled dog sitting on a pedestal of rock overlooking the canyon on the west side. It looked pretty amazing; we knew we had to try and get that same shot. I wouldn’t dare put Truman up there by himself, but I was able to climb up the rock and sit with him in my lap. It’s the ultimate Travelling Tru shot. The pedestals were perfectly situated for photographs – mother nature is quite intuitive sometimes. 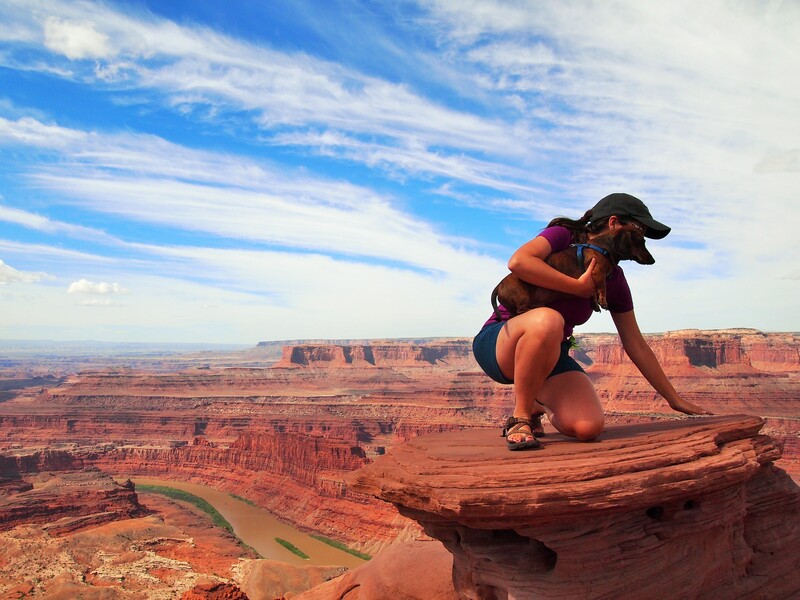 We walked over to the east side of the point to take a look at the views over there and then decided it was time to head back into Moab to pick up Zach and grab a proper breakfast – a Red Rock Bakery & Cafe bagel sandwich was calling my name. 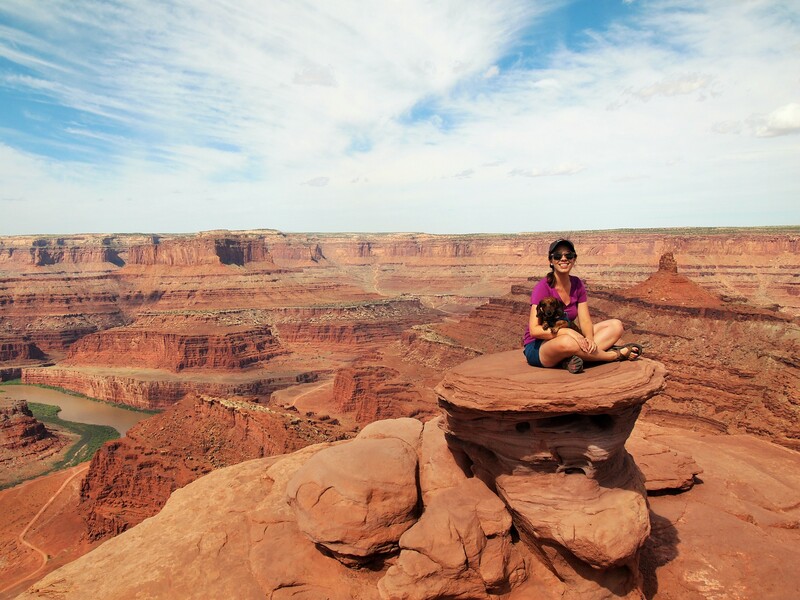 Until next time, Dead Horse Point!